St Laurence Church is the Parish Church of the Shropshire town of Ludlow, which I visited during the summer while on holiday with my family. The Church was originally built in the 11th Century, then rebuilt in 1199. It was again mostly rebuilt during the 15th Century, then repairs and restoration took place between 1859-1861. 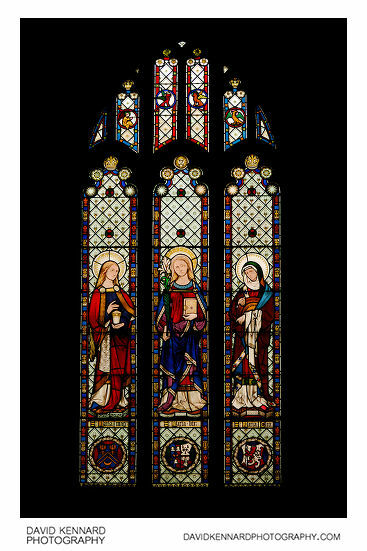 Inside St Laurence Church features some beautiful stained glass windows. 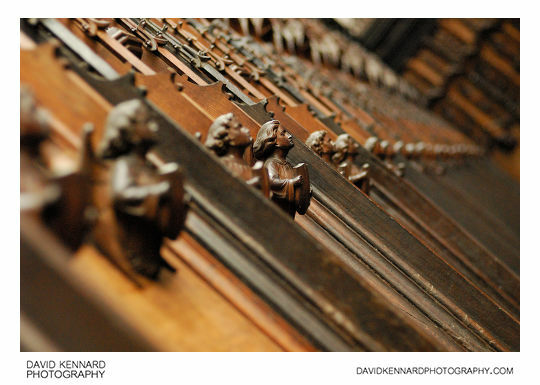 In the choir stands there are lots of interesting carvings. It is quite dim in the Church, so a high ISO and VR or large aperture is required when shooting handheld (I'm not sure if tripods are allowed). 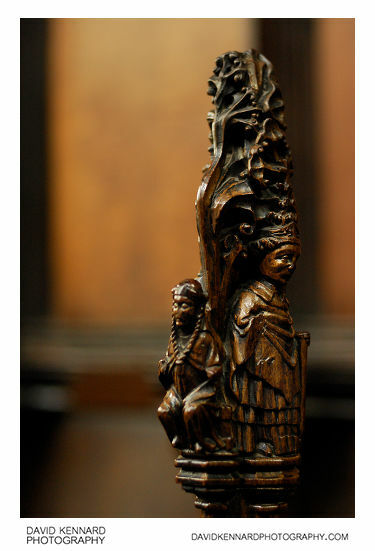 This carving is quite interesting, being of a Boy Bishop. It is part of the Choir Stands, which is appropriate since it would be a Choirboy who took on the role of the Boy Bishop. The Boy Bishop would be elected on the feast of St. Nicholas (6th December), and would retain his authority until Holy Innocents Day (28th December). 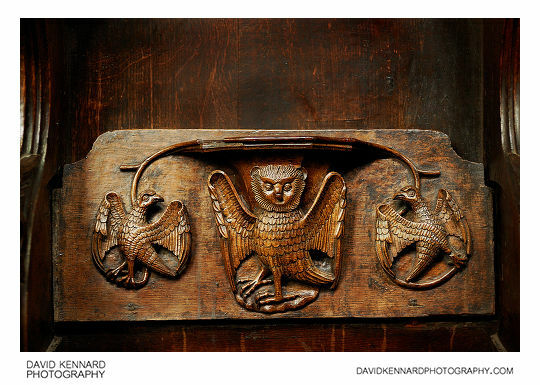 St Laurence Church also seems to have a reputation for excellent Misericord carvings. 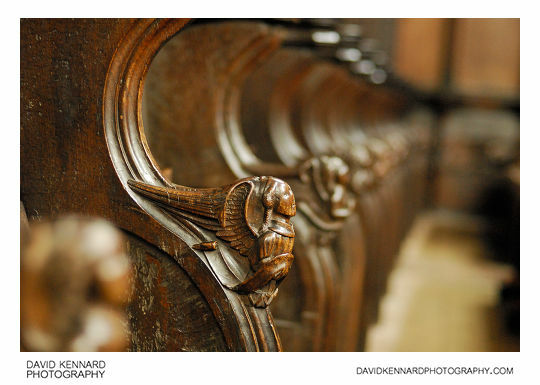 A misericord is a fold-up seat with a small wooden lip at the front of the seat. During prayers you would be expected to stand up, and in the Middle Ages, prayers could go on for quite some time. So you could flip your seat up, and lean on the small lip at the front of the seat. Misericordia literally means 'act of mercy'. 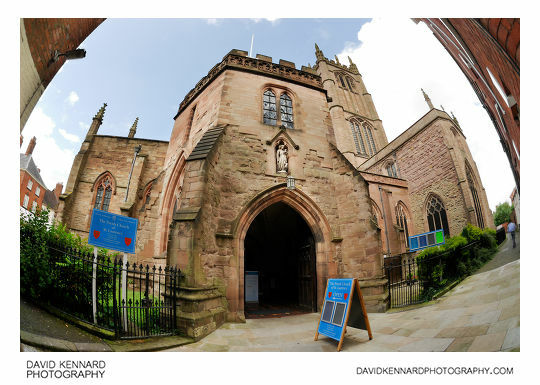 More information on St Laurence Church, Ludlow: Wikipedia Official website.